Ergonomic Seat Cushion [Ergonomic Seat Cushion] - $14.95 : NewDaVincis.com!, Great Innovative Products, Gadgets and more. An innovative, convenient and affordable solution to back pain. As anyone who has to sit for a lengthy period of time can attest, after sitting for too long, the back begins to hurt and the legs tense up. It becomes uncomfortable, but what can you do when you?re stuck to an office chair all day, or driving a truck, or sitting in that awful rush hour traffic? Developed by an experienced chiropractor, the Ergonomic Seat Cushion transfers pressure away from the pelvic bones to alleviate back pain and increase comfort while the user is seated. 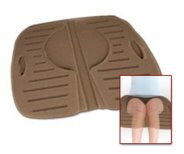 The product, featured on QVC, is an ergonomically-designed pad that is easily portable for use in the car, at the office or at home.